Jury duty pay and time off is an employer provided employee benefit, even if the time off and pay is mandatory by law. 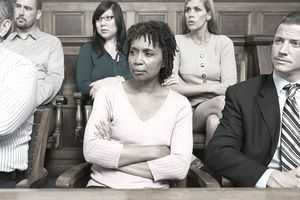 How the employer handles jury duty is largely a decision of the employer unless the state or Federal government has mandated legal requirements. When employers consider a jury duty leave policy, the main policy questions they must answer are these. How the employee must document jury duty for the employer. When the employee must report the summons to jury duty. How the employee must handle partial days at the court. How much paid leave to allow the employee for jury duty. How to provide unpaid leave that extends beyond the paid leave. How to deal with the court-provided jury duty payment. How to ensure that an employee suffers no negative consequences for serving legally required jury duty. Your Company recognizes that jury duty is a civic responsibility of our employees. You must provide a copy of the jury duty summons to Human Resources and your manager within one day of receiving the summons. Occasionally, the summons to jury duty will occur at a time of the year when the employee or the employer might experience a significant impact on customers or staffing from the loss of the employee to jury duty. In these instances, the employer may write a letter to the court requesting the postponement of the employee's jury duty. Your employer provides paid leave when an employee must serve on a jury. You will be paid your normal salary or hourly compensation while you are on jury duty for up to 15 days in a calendar year. No overtime payments, if you are eligible for overtime pay, are made during the time that you serve on a jury. At the end of the 15 days, you may use your accumulated paid time off (PTO) if you wish to continue to be paid while on jury duty. You may also take the additional jury duty time as an unpaid leave of absence. In no case will your employment be affected if you perform jury duty. You will not be harassed, threatened, or cajoled into getting out of jury duty and your same job will be available upon your return. If you report for jury duty and are dismissed, you will be expected to report for work for the remainder of each day on which this occurs. If you are told that you do not need to report to the court on any day of your jury duty stint, you are required to come to work. Additionally, you will be expected to sign over to your employer any paycheck you receive from the courts for the first 15 days you serve on a jury, to offset the fact that your employer is paying you for those days. If you serve on a jury for a longer time period, you can keep the pay provided by the court after 15 days. If you take an unpaid leave of absence for additional days of jury duty, your benefits such as health care, dental, vision, and disability will be continued and the normal payments that you make will be subtracted from your pay on your return from the unpaid leave. Employees are expected to work with their manager to ensure that serving jury duty does not adversely impact your customers and your coworkers.